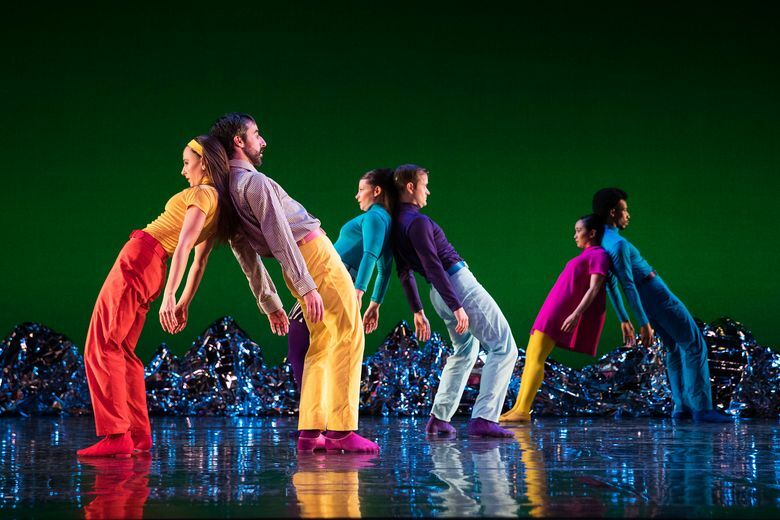 Seattle-born choreographer Mark Morris’ dance vision for the 50th anniversary of the classic Beatles album is swoony, swirly, bouncy and a tad too soft-edged to do its source material justice. But Morris’ choreography is just one element of the show. When The Beatles’ “Sgt. Pepper’s Lonely Hearts Club Band” came out in 1967, it was a Big Event. Radio stations played it in its entirety. I heard the first midnight broadcast of it, pressing my transistor radio close to my ear under my pillow so my parents wouldn’t catch me up so late. The album was utterly unlike anything that came before it in pop music. Fifty years later, it’s still a treat — especially in Giles Martin’s dandy stereo remix which came out last summer. The downside of tampering with such a classic, of course, is that some audiences — especially if they’re of a certain age — may take issue with it. “Tampering” is exactly what Seattle-born choreographer Mark Morris has done with “Sgt. Pepper at 50: Pepperland,” which had its U.S. premiere at the Moore Theatre Friday night, after debuting last year in Liverpool. His hourlong dance vision for “Pepper” is swoony, swirly, bouncy and a tad too soft-edged to do its source material justice. But Morris’ choreography is just one element of the show. Elizabeth Kurtzman’s colorful costumes — wild matchups of primary and pastel hues, with the odd bits of Op-Art haberdashery to spice them — are just as important. Equally crucial is Ethan Iverson’s reinvention of the six Beatles tunes used. Iverson is a founding member of the jazz ensemble The Bad Plus (frequent Morris collaborators), and he indulges in some wholesale reinvention of these classics. “With a Little Help from My Friends” becomes a strangely halting, minimalist affair, with tentative drumbeats and single high notes on the piano keyboard following the vocal line of baritone Clinton Curtis (more a show-tune guy than a pop singer). Iverson, just as peculiarly, dispenses with most of the words to “A Day in the Life,” replacing them with a wobbly theremin. Still, the show has some terrific moments. 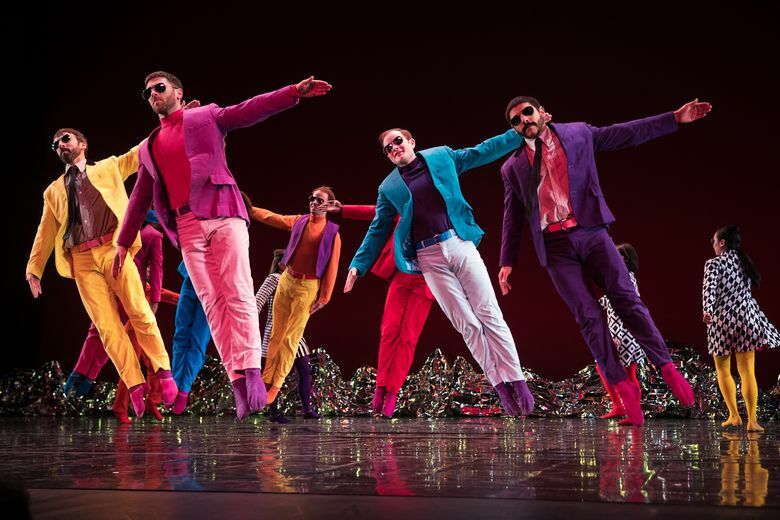 The music-hall cadences of “When I’m Sixty-Four” are put by the six-piece band through a crazy rhythmic scrambler that applies to the woozy dancers as well. (Think beatnik Rockettes keeping goofy yet impeccable time with each other, and you’ve got the picture.) “Within You Without You” may be the high point, with its jazz-raga vibe and gentle, dreamy pageantry. If you’re a Beatles purist, you’ll probably miss the vocal harmonies and the sardonic way those Lennon-McCartney songs comment on themselves. (Remember: John Lennon’s backing vocal on “Getting Better” was “It can’t get no worse.”) Iverson’s writing for percussion feels particularly limited, making you long for Ringo Starr’s drumming with its love of every quirky corner of the tune he can find. Eye-popping prettiness was enough for many attendees, however. They gave it an effusive standing ovation.